Dimensions: 4 x 6 in. 120 tear-out lottery scratch tickets. Perfect for a raging night out, these 120 lottery scratchers feature drinking games, party dares, scavenger hunts, and tons of other hilariously fun activities. 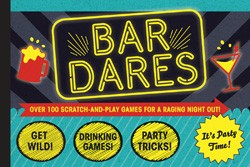 From Spin the Wheel to Shot Roulette, these games will keep the booze flowing and the party going all night!